Why climb the 7-Summits? Before I can answer that question, I need to go back in time and tell something about my history. I was about 16 years old when I first visited the European Alps. It was part of an school-introduction-program. We went to Austria by bus, a 12- hour ride from the Netherlands. During this week we did some hikes and slept in the same dorm every night. But… the mountains impressed me! I loved them! The space, the air, the emptiness and the effort it took to reach the summit of these mountains. Once back home, the mountains were far away. Both in distance and attention. I’m born in a family that loves to ride bikes. Naturally I followed my fathers footsteps and started bike racing. I was pretty good at it! I won various races, but also learned about the other side of success; crashing, losing and suffering. I lacked the true winner mentality in biking. For me, it was enough to just ride my bike. I could feel very satisfied when riding a beautiful race but finishing last. Obviously, that’s not the mentality that makes one a successful bike racer! I realized bike racing suits me, but isn’t the best way for me the challenge me to do the ultimate. I needed something else.. Finally! Back in the mountains! 10 years after my initial meeting with the Alps, I finally returned. Together with my girlfriend I did a 7-days-hike in the Alps from cabin to cabin. We were prepared, if not over-prepared. But, I learned a lot that week, and again, the mountains impressed me a lot. I couldn’t keep my eyes from those beautiful, rough peaks. They where talking to me in my head: “Bart, get to the summit!”. Next year, I decided to take some steps. I went to the Alps for a two-week-training (C1) from the Dutch Alps association (NKBV). The first week was training; rescue techniques and basic glacier traveling. The next week was a tour, again from cabin to cabin, including some days on the glaciers. I felt so good in the mountains. Again this feeling of freedom, challenge and possibilities. This time I also learned about the risks, which made it even more exiting! Following years, I did two more trainings (C2 and C3) and some unguided glacier-tours with friends. Every year, I returned with more aspirations, more mountains I wanted to climb, the feeling of developing. But I never returned with the feeling I was even close to my own limit..
To find that point, I knew I’d have to go higher, to more spectacular mountains/summits, probably outside the Alps. I considered climbing Aconcagua, but doubted if this was challenging enough. During my last training in the Alps I met a guy who climbed Denali, the highest summit of North-America. We spoke about his trip for hours, and I felt this was the challenge I was looking for. I needed to climb Denali! I needed to prepare for Denali, so I made a plan to climb Grand Combin (4314m, Swiss) and Mont Blanc (4804m) from Italy. Climbing both mountains would be an excellent preparation for Denali. But the plan failed.. Due to circumstances, I didn’t climb any of them and returned home after spending 3 days in the Alps. So much for preparation this year it seemed…. No way! I did have a plan B: climbing Mount Elbrus. I took care of all necessary preparations within a month. First week of October 2016 I was in Russia to climb Mount Elbrus (5642m) north face. I succeeded: I reached the summit of my first mountain of the 7-summits! I felt pretty bad at the summit due to altitude sickness. But did I find my limit? No way! I wanted more! 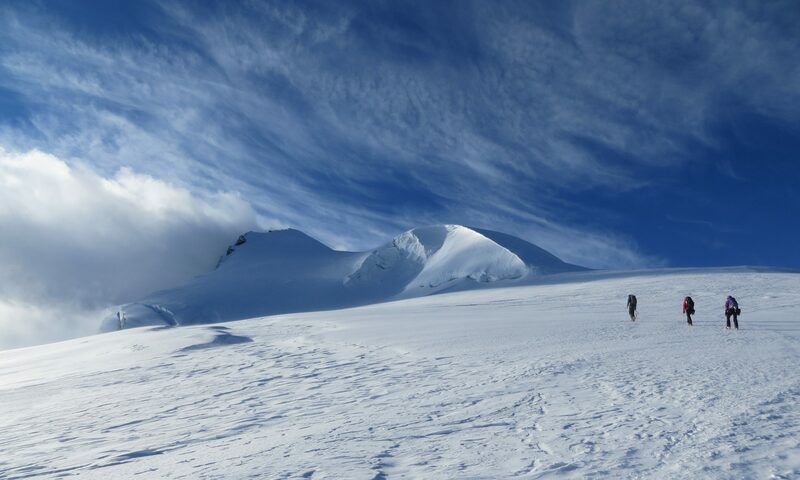 I returned from Elbrus, and I knew; This is what I love, this is what I’m good at. I need to climb all 7-Summits. To push myself further, to find my limit, to see the world and tell the world what I learned. To show the world dreams can come true, as long as you believe in them. Everybody has their limits. Some hurt when you find them. Others make you feel very happy. When you found a place where your limit both hurt and make you feel happy, you have found the ultimate; The thin line between pleasure and pain.